Roger Federer mastered Rafael Nadal in their first meeting in almost two years to win the Swiss Indoors final 6-3, 5-7, 6-3 on Sunday. The top-seeded Federer ended a five-match losing streak against Nadal, including the last time they played for a title in May 2013. ''It was a very special day,'' said Federer, who won his hometown event for the seventh time. 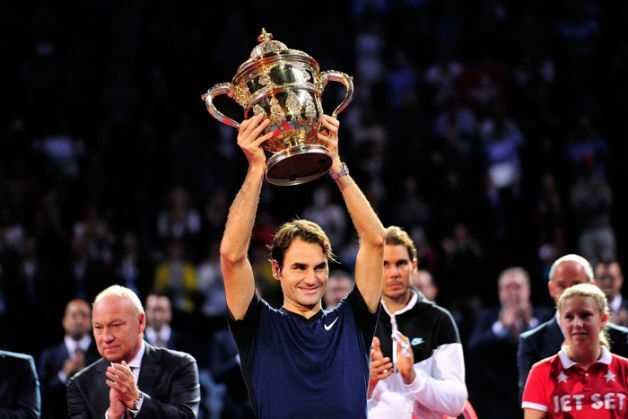 ''Probably it was my best victory here in Basel.'' With the match finely poised in the deciding set, Federer hit a series of ground strokes for winners and broke Nadal's serve for a 5-3 lead. Federer created his second match point by meeting Nadal's hard forehand with a backhand volley winner at the net, and clinched it when Nadal's service return flew long. ''I lost but I was close to winning, very close,'' said Nadal, who still has a 23-11 career hold over Federer, including 14-7 in tournament finals. The Swiss Indoors, where Federer was once a ball boy, is now the fifth tour event he was won at least seven times. He has eight titles at the Wimbledon warm-up tournament in Halle, Germany. Federer dominated the first half of the match, finding the lines with his ground strokes and commanding at the net, but he was broken at 5-5 in the second set and Nadal forced a third. The old rivals had not faced each other in a title match since Nadal's victory at the Rome Masters 2 1/2 years ago. They last met on court for an Australian Open semifinal that Nadal won in three straight sets in January 2014. "Six hundred-plus days have gone by a so a lot of things have happened,'' Federer said. ''Definitely I had the right game plan today.'' Federer broke Nadal for a 3-2 lead, creating the chance with a backhand passing shot and taking it with a fierce forehand winner. Federer clinched the set with four straight points on Nadal's serve, sealed by a forehand crosscourt winner. The Swiss even stepped up his intensity to start the second set, needing just a few strokes to win the opening game.